I have seen documentaries and read articles about the Ice Age. There were a lot of great species of megafauna that obsess me here and there. I love them very much. What I have never loved, however, are the discoveries of woolly mammoths well-preserved in sheets of ice. Some of the mammoths still have mouthfuls of vegetation in place, as though they had been caught mid-chew. How fast did the Ice Age happen? How much time passes while eating one bite of food? Did glaciers come down from the Terrible North in mere seconds, trapping all living things and eventually dragging their bodies some of the way back? Whatever the real answer is (I have so far refused to ever dig around for that information because I am frightened enough as it is), the fact remains that whenever the weather man speaks of a “polar vortex,” I get a little nervous. “Siberian Express” in the form of weather is a dreadful notion. 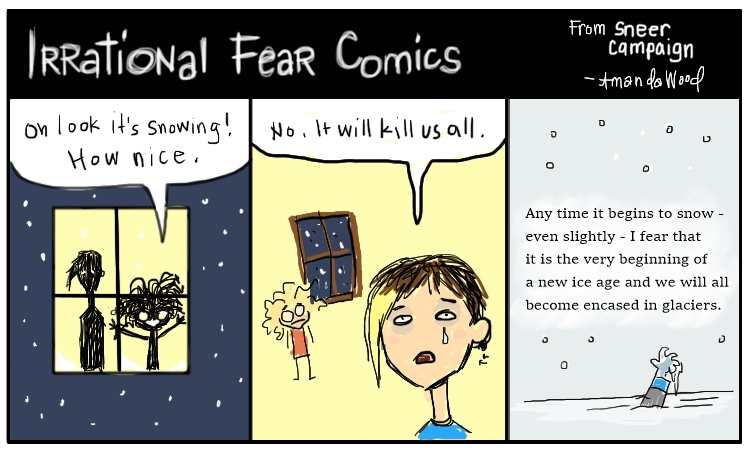 Whenever I so much as see a flake of snow falling from the sky, I wonder if it is the start of our inevitable deaths by frozen ice. I watched footage from a few years ago when it was so cold and so windy that a lake appeared to actually produce glaciers and they ran ashore and broke the exterior walls of houses, and I feared for us all. It happened so fast that I could imagine in a few thousand years, new scientists would find perfectly preserved men and women encased in ice sheets, bites of scrambled eggs in their mouths, caught unexpectedly, too fast. Horrible winter time. I will not relax until the spring thaw.